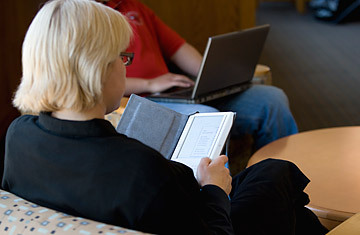 I have a lifelong friend  let's call her Mom  who used to sneer at the very notion of e-books. Then she got an Amazon.com Kindle as a gift and sheepishly discovered that she adored it. But when her Kindle broke, she started reading the e-books she'd already bought from Amazon on her BlackBerry, using the Kindle app available for that phone. And she quickly realized that the phone that was already her constant companion was the ideal e-reader for her. She's got plenty of company. Stand-alone e-readers still have their place: I like the Kindle (which starts at $139) and Barnes & Noble's Nookcolor ($249), both of which pack nice screens into booklike form factors. (The Kindle's E Ink technology has the additional benefit of letting you read for weeks on a battery charge.) Still, if you own a laptop and a smart phone  and maybe even a tablet such as Apple's iPad or Samsung's Galaxy Tab  one more portable device with a display may be one too many. I do most of my e-book purchasing at Amazon's Kindle store, in part because I started frequenting it back when I used a Kindle more often. All my books are available on all my devices, with automatic synching that keeps track of my place even as I hop between Kindle apps. I can inhale a hundred pages of an e-book on my MacBook during a plane trip, then snack on a few pages at a time on my Verizon Fascinate phone as time permits; I even get a startling amount of reading done while waiting in line at Trader Joe's. Which is not to say that I'm giving up on dead-tree books just yet  actually, there's a stack of them on my nightstand waiting to be read. Plenty of e-books have pictures, but the formatting tends to be crude, and tiny phone screens don't help matters. Too much visual splendor is downright fatal: the sole New York Times nonfiction hardcover best seller that's unavailable from Amazon, Barnes & Noble and Kobo is Jon Stewart's Earth, a profusely illustrated volume that would fall apart if it lost its original layout and images. Copy protection is another issue. Most e-books are locked up to discourage piracy, which means that if the seller goes under or simply loses interest in maintaining its servers, you could lose access to items you've paid for. (Several large companies have already left buyers of movies and music in the lurch.) Nobody knows what sort of gadgets we'll be using to consume content 10 or 20 years from now, or whether e-books we purchase today will work with them. And while Amazon and Barnes & Noble's apps have lending features, they have a hobbled, joyless feel  you can only lend certain titles for a maximum of 14 days, and can't lend a specific title more than once. For all these reasons, it's best to treat e-books as ephemeral, semidisposable items  like paperbacks you could lose at the beach without too much angst  rather than heirlooms. For me, though, the single biggest downside of e-books is that there aren't enough of them. Amazon, Barnes & Noble and Kobo are in increasingly solid shape when it comes to new releases, and they have vast repositories of public-domain works available for little or no money. That leaves everything else  books still in copyright (and often still in print in wood-pulp form) that are more than a few years old. Amazon seems to have the best selection of such titles, but I'm still pleasantly surprised when I search for something and find it. John le Carré, for instance, has written 22 novels; only the most recent six are available from Amazon, B&N and Kobo, and the Google eBookstore has just one. Onetime blockbusters such as Lake Wobegon Days and ...And Ladies of the Club are missing. Terry Southern, one of my favorite writers, died in 1995 and is therefore nearly invisible in the digital realm. But hope may be at hand. Since 2004, Google has been scanning printed books by the truckload for its Google Books project  15 million of them so far. Publishers and authors sued to foil the company's plans to put this massive trove online, but a settlement is wending its way through the legal system. It would cut copyright holders in on profits and permit Google to offer out-of-print books unless the owner expressly demanded otherwise. Imagine having instant access to most of the books ever written on just about any Internet-connected gizmo you own. If full-blown Google Books gets the courts' blessing, that futuristic fantasy could turn into reality within the next few months, and voracious readers everywhere will have reason to rejoice. I'm already drawing up my reading list.